To learn how to research and manipulate data. To learn how to re-edit and re-purpose an archive film. The suggested questions and activities for each clip are, to some extent, interchangeable. Many of the activities can be group based. The activities have been assigned to subjects to illustrate the cross-curricular aspect of using moving image. All of the clips have older people as a feature. Watch the short clip Glasgow's Yesterdays. What can you see which is different from today in a) the clothes b) the train station c) the reaction to the camera?. How do older people take holidays today? Why is there only one camera shot? Research some data in the class to do with grand parents eg. How many great grandparents or great great grandparents there are. Plot their ages on a graph. Google “old age”, what can you learn about old age today? Where is Wemyss Bay? What can you find out about it? Watch the short clip St. Kilda, Britain's Loneliest Isle - Clip 3. 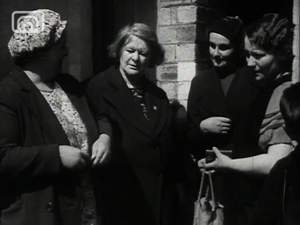 This is an amazing silent black and white clip which documents a trip to St Kilda by some dignitaries. There are some interesting intertitles to help to give the film a narrative (the intertitles also give information about the film-makers). This footage is quite extraordinary, giving some idea of the extreme conditions on the island. For the opening shot of St Kilda, the camera is in the air. Is this a helicopter shot? The second shot is of a rowing boat full of men. Where is the camera? How did it get there? Do you think that the children really hide or was it an instruction from the director? What does the intertitle “Main street St Kilda – keep to the left mean”? What is the man on the bench doing whilst the woman is spinning wool? What was Margaret McDonald saying? How would you feel about going bird catching? Why do we not eat seagulls? How would life be for an old person on the island? Produce a six-shot storyboard to illustrate bird catching on St Kilda, add a voiceover. Write a voiceover for the film. Add the voiceover using simple editing software. Find out what you can about St Kilda. Research different foods that were eaten in the past but are no longer eaten now. Watch the short clip ARP - A practice exercise for dealing with a gas attack. 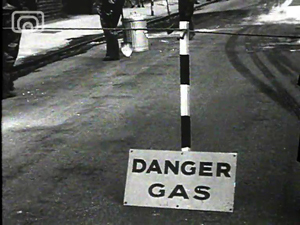 This silent black and white clip documents the Home Guard in Glasgow practising for a chemical or gas attack. Interestingly the passers-by carry on as normal. It is not apparent what is happening in each scene. What is happening in each scene? Some scenes have a large crowd, why is this? Who and what were the Home Guard? What do you think the people in the film are thinking about the approach of war? Can you describe what people are wearing? How does it differ from modern clothes? Draw a Home Guard member in their full gas attack kit and label the items. Produce a poster warning of a gas attack and what to do if one happens. Research the internet to find an account of a world war gas attack. Write a documentary voiceover for the film and add it to the clip in Moviemaker. Write a voiceover for the film as if it was a trailer for a war film. Write a voicover for the film as if it was a German propaganda film showing how silly the British people are. Watch the short clip Lochgelly Old Age Pensioner's Drive to Crook O' Devon. This is a wonderful black and white clip with music that has been added later. It is full of excited happy people and documents the large send off for the holidaymakers. The opening title (again added later) gives good information about the clip as do the original intertitles. The whole film is rather moving. What do you notice about the people in the film? Pick one or two characters and imagine this person's life, what do they do? How do they live? What are their ambitions? Are they still alive? How old would they be? What did the old people do at The Crook of Devon? How would this trip differ from a modern day outing? What does “The advance party with necessities of life” mean? Locate Loch Gelly and Crook of Devon. 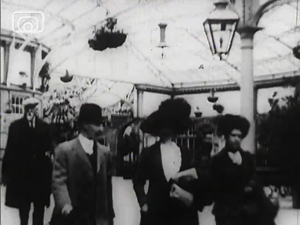 Compare what modern OAPs do for day trips with this film. Find out all you can about transport in 1928. Work out how many people went on the outing. Is this film a celebration of old age? How do we celebrate old people today? 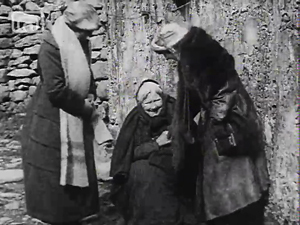 Watch the short clip Tenement Warden. A black and white propaganda film with original music and voiceover. There is a lot of demographic and social information in the voiceover. The general tone of the film is cheery and optimistic. What is your main observation of the streets of Glasgow in the film? How does the music affect the film? Why is there no sync sound (sound recorded at the time of filming)? What is the difference in the roles of the men and women? There is some “modern housing” in the film. How is this different from today’s modern housing? Write a plan of action that Mr Campbell had to follow if the air-raid siren sounded. Write a story of an air raid attack written by a child living in one of the tenements. Write a set of instructions for making and applying a bandage sling. Write a dialogue for the very last shot of Mr Campbell and his wife at home in the evening. Research World War II air raids and bomb damage in Glasgow. Try to find an original account of an air raid attack from an old person. 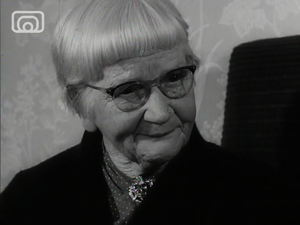 How did older people contribute to the Warden Tenement system and what do older people do in today’s society to contribute? Watch the short clip Health of a City – Clip 3. 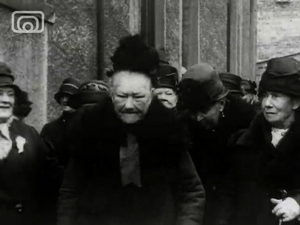 A black and white documentary film with sync sound. The clip appears to be a propaganda film promoting how the “Corporation” looks after its old people and is improving the health service. It is interesting to note the use of close ups of hands and the way the film is edited with a wide variety of shots, music, use of stills and sound effects. The camera is not static and moves around with the subjects as well as changing levels. The voiceover is informative and authoritative without being patronising. It is interesting to note how much more sophisticated this clip is than the previous clips. What jumps out in the film as being very different from today? The voiceover explains the “new health service”. How did people receive medical treatment before this service? How do the film-makers display their pride of Glasgow? Why do the film-maker use such a variety of shots? Can you identify any low or high angle camera shots? What different styles of music do you hear in the film? The film is generally very optimistic, how do you imagine some of the people might feel who were in the gym lessons looking back at the film now? How do you think you may be looked after in old age? What do you think is the average age to live to? What are modern day health concerns that the people in the film might not have considered? In threes, prepare a presentation on a health issue and present it to the rest of the class. Produce a table of healthy activities, include eating, physical activity, mental and emotional health. Have people in the class rate themselves on how they keep themselves healthy using the table. Produce a guide to emotional health. Invite an old person into the classroom to talk about differences in health fifty years ago. This lesson guide was developed by Scottish Screen Lead Practitioner Tim Flood.